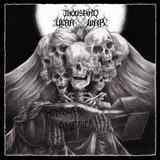 It seems that only recently I have reviewed a debut by Thousand Year War, an American now-California-formerly-Alaska band. Fueled by Viking inspired riffs, the band debut Tyrants and Men reminded of Amon Amarth in spots, but raised questions as to where Hiram Lohr, aka Myth, the band’s soul and multi-instrumentalist (everything except drums) will be taking Thousand Year War next. The answer can be, in part, glimpsed from the short self-released outburst Kingdom of America. While taking the band into a somewhat different direction from Tyrants and Men, thus avoiding repetition and stagnation, to me personally, it wasn’t the direction I was entirely enamored with. Maybe it is less heavy production of the EP, maybe it is the overlayering of vocals with more hysterical screaming always coming out on top and dominating, but even a song or two (like the title track from the debut) on Tyrants and Men displayed some thrashcore tendencies by Thousand Year War. The emphasis has now shifted to more ‘core. Be it the subject matter, having something to say on the political front with the title track, or, again, production lacking heft, but the EP opens up with a pair of such songs. Drums blast, guitars riff without much structure or definition, and Myth recites his litanies, pretty much non-stop in Weep As We Die. He manages to further bury melodic tremolo under screaming in Vulture Eyes, producing what probably amounted to the least attractive vocal moments on the release, the taste that lingers after Kingdom of America is through. Fortunately, the man has not forgotten how to write strong riffs or stand-out melodies. Nice thrash elements come out in Gather the Wolves and, interestingly enough, it is Misfits cover London Dungeon which produces the best guitar tone. As much as I was not a fan of the vocals on Kingdom of America, it is probably little surprise then that my favorite track ended up being instrumental Doom Rides These Mountains, with the riffs harking back to I, Amon Amarth, and what Thousand Year War did the last time around. While clamoring for development, there was definitely movement afoot in Thousand Year War, so that question was definitely answered, yet I am not sure those were the changes I expected to see or I necessarily liked.